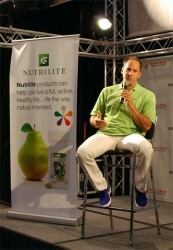 White Sox infielder Omar Vizquel gave fitness tips at a Nutrilite workshop at the Rock “n” Roll Chicago Health & Fitness Expo at the McCormick Place on Saturday, Aug. 13. Runners participating in the half-marathon on Sunday picked up their packets and visited variety of vendor booths. From Nutrilite, Miller Genuine Draft, Muscle Milk to Dodge and Sports Authority, just to name a few, all fought for the runners’ attention. Vizquel said that consulting with a nutritionist could be beneficial because they teach how to stay away from the foods that affect and slow us down. He also suggested avoiding products like milk, white rice, breads and flour. “We’re not saying you’re not going to eat it, you can eat it may be once or twice a week but if you do that, you have to be able to burn it off. Like if you have a big plate of rice, beans and stake…that stays in your body for a long time, so you have to try to do something that night or the next day to get it out of your body,” said Vizquel. Although admitting that he doesn’t follow a strict diet and sometimes eats a lot of junk food, Vizquel said that he does go to the gym at least three or four times a week to compensate. “I think going to the gym is really important because your metabolism just burns that food you don’t need and that makes you feel good about yourself,” said Vizquel. Vizquel recommends exercising at least one hour every day to stay fit and invites everybody to find out more nutrition. “I didn’t know about nutrition until I started reading and learning from other people about what they do and how they diet,” said Vizquel. After offering a variety of tips on fitness and diet, Vizquel signed autographs and took pictures with fans. Later that day, the White Sox beat the Kansas City Royals 5-4. Veronica Zamora, of Chicago said she and her friend Adriana were running the half marathon. Also at the expo was Veronica Zamora a resident of Chicago who was going to run the half-marathon in honor of her friend. “I have a friend who was diagnosed with cancer. She’s ok now but I always wanted to do a marathon or a half-marathon and this race has meaning because of her and because it benefits the American Cancer Society,” said Zamora. Zamora said this was her first race and felt very excited to run the race along with her friend Adriana. “I feel very pumped for tomorrow. I had a little bit of nerves before because I have my own personal time that I want to finish the race in. I wan to finish less than two and a half hours,” said Zamora. 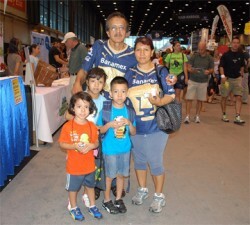 Fernando Velazquez, 64, also from Chicago attended the expo with his wife and kids. “This race will be my fourth run. I found out about this run at the gym and I’ve been ready to go since yesterday,” said Velazquez. Velazquez said that he looks at the running as a fun activity, which brings many healthy benefits. He also said he’s been running at least six miles every day for the past five years. “If you run, you feel good, you’re healthy, your blood pressure is right, your cholesterol levels are right, in general you just feel good. Right now I am 64 years old and I don’t take any pills…not one pill, and that’s why I run and I just like it,” said Velazquez. Fernando Velazquez finished the half-marathon in 2:05:46.